Shamika Ravi from Brookings India and Darrell West from The Brookings Institution, Washington D.C., yesterday in New Delhi. This is the first such independent study conducted by a research institution on the topic of mobile spectrum and the government’s policies to facilitate its development. The government’s flagship policies like Digital India, Smart Cities and JAM (Jan Dhan, Aadhaar and Mobile) rely heavily on mobile technology and digitisation. Mobile infrastructure and spectrum capacity are fundamental to achieving the objectives of growth and inclusion. 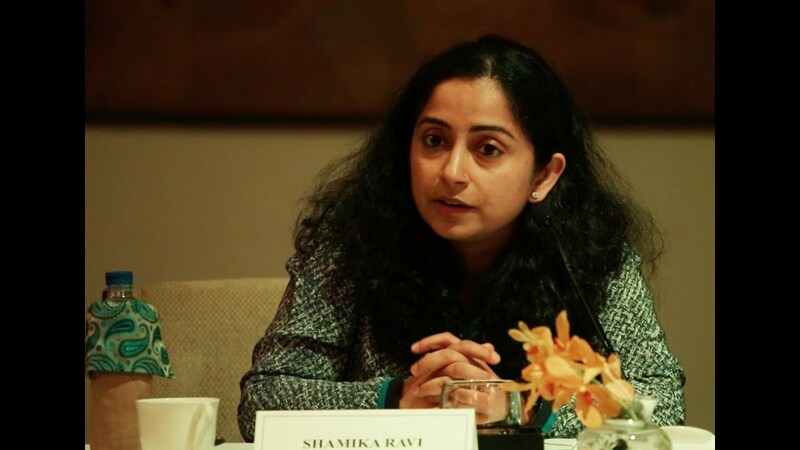 While releasing the study, its authors Dr Shamika Ravi, a Brookings India Fellow working on Global Economy & Development, and Dr Darrell M West, the vice-president and director of Governance Studies at the Brookings Institution in Washington D.C., raised concerns that while shortage of spectrum availability is a global phenomenon, in India this problem is particularly acute. Also speaking at the release of the study were former chairman of the Telecom Regulatory Authority of India, Dr Rahul Khullar, and the BJP National Technology Head, Mr Arvind Gupta. The research shows that though India and China have comparable spectrum availability today, India’s future pipeline for licensed spectrum is insignificant compared with China’s mammoth growth plans. Indian operators have significantly smaller amounts of spectrum even compared with other Asian countries like Bangladesh and Malaysia. Extremely high levels of competition in the sector have ensured that Indian consumers face the lowest call rates ($0.01 per minute) and hence one of the highest usage (365 minutes per subscriber per month) globally. These benefits, however, are short term and unsustainable in the future, the authors warn. Rising congestion, high fixed costs of the business and high auctions prices all point towards this. In some previous auctions held in India, spectrum costs were nearly 25 times more than the US, France, Spain, Sweden, Germany. While giving recommendations for future action, the study says that the experience of other countries demonstrates that investments in mobile infrastructure and sound spectrum policies can create significant economic growth. Through affordable devices, reasonable telecommunications fees, and low mobile taxes, the digital sector can prosper and propel the overall economy. The objective of government policy in this sector is two-fold: to allocate spectrum efficiently to the best use and maximise revenues to the state. These two objectives can be achieved harmoniously if the government shifts focus away from short term revenue maximisation. Opening up spectrum access will be the first step towards reaching this goal. “The government should continue to free up available spectrum for commercial development. This includes vacating certain bands held by the Defence Department and holding auctions that have reasonable reserve prices,” it says. Other suggestions include revamping auctions, making sure that costs are affordable so that consumers don’t pay high telecom prices, enabling the trading and management of spectrum, and harmonising regional rules. Mr Arvind Gupta said the BJP leadership was cognizant of the problems of spectrum availability and committed to working towards resolving them, especially in view of its planned digital programmes. “But we are also looking at alternate technologies to take some load off mobile telephony,” he concluded. It is clear that the Indian government is committed to a digital transformation through various flagship programmes. But in order to have a viable digital ecosystem, it is also crucial to have long term policies that promote efficient usage and healthy evolution of the telecom sector through trading and consolidation, the Brookings’ study says.